You are invited to “an everyday day” – a solo exhibition of new work by Hanoi-based artist Nguyen Quang Huy. 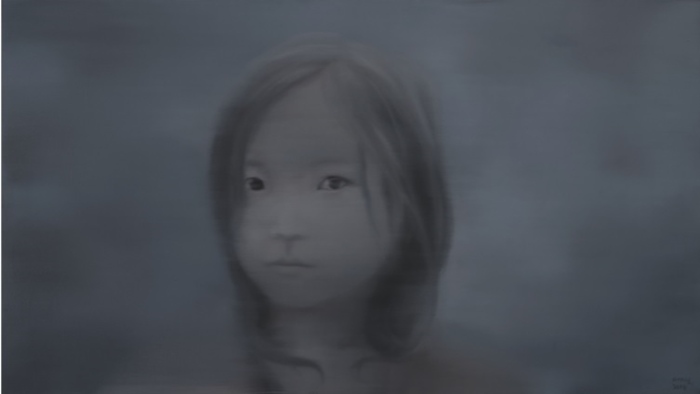 Considered one of Vietnam’s pioneering artists following the Doi Moi reforms initiated in 1986 (a period of economic liberalization marked by increased artistic experimentation), Quang Huy will be showing a suite of oil paintings depicting Hmong women and misty mountainscapes created with hazy brushworks in his distinctive muted palette of blue-grey grisaille. Acclaimed for his versatile practice including video and installation, Huy focuses only on painting for this show – a medium that has remained central to his practice for over two decades. Much of the artist’s work is inspired by the northern highlands of Vietnam, which he began to visit during his days at the Hanoi Fine Art University with one of his professors who lead yearly excursions to sketch in the mountains. On these trips he was accompanied by his classmates Nguyen Van Cuong and Nguyen Minh Thanh with whom he exhibited extensively throughout the 90s, their troika constituting an influential node in the Hanoi art scene during this progressive period. Since graduating in 1996, Huy has continued to make a pilgrimage to the mountains every year, where he photographs the winding roads disappearing into the fog, and the stoic Hmong women who walk those roads wearing traditional dress with massive burdens upon their backs, before returning to his studio in Hanoi to process the experience. Dissatisfied with traditional photorealism, Huy developed his own unique voice as a painter – characterized by the use of intentional blurring and a minimal almost monochromatic color scheme, borne out of his search for a more evocative means of capturing the spiritual essence of his subjects. Influenced equally by Buddhist philosophy and the animistic worldview of the Hmong, which maintains that there are spirits inhabiting all animals, plants, rocks and places, Huy sees both his landscapes and his portraits as representations of living registers upon which the history of the people and the land are imprinted, if not visible to the naked eye. Just as the limestone cliffs of Halong Bay have witnessed countless generations come and go like the constant waves that have shaped them, so might the soul of a single woman have recorded the history of an entire people across a succession of lifetimes. It is this subtle quality which Huy strives to convey in his quiet and pensive, ethereal paintings. The exhibition title is inspired by Quang Huy’s poem ‘Gặp’– a collection of poignant memories recounted like a chant or a prayer, and a zen-like meditation on the fleeting encounters between men and women, mountains and mist. Nguyen Quang Huy was born in 1971 in Ha Tay, Vietnam and graduated from the Hanoi University of Fine Arts in 1996. He belongs to the first generation of experimental Vietnamese artists who emerged following the Doi Moi reforms initiated in 1986. Quang Huy has exhibited extensively since the 90s. He has held solo exhibitions in Vietnam, France, the UK and Germany and participated in numerous group shows in Asia, the US, Australia and Europe. Notable exhibitions have been held at the Vietnam Fine Art Museum, Hanoi, Vietnam; EunAm Museum of Art, Gwangju, Korea; ifa galleries, Berlin and Stuttgart, Germany; Stenersenmuseet, Oslo, Noway; and Pavillon des Arts, Paris, France. He has held residencies at Casula Powerhouse Art Center, Sydney, Australia; Pacific Bridge Gallery, Oakland, CA, USA; and Artist Unlimited, Bielefeld, Germany. Quang Huy’s works can be found in international collections such as the Fukuoka Asian Art Museum, Japan; Andaman Cultural Study Center, Thailand; Post-Vi Dai Collection, Ho Chi Minh City, Vietnam and Geneva, Switzerland; and the World Bank, Washington, DC, USA. Quang Huy lives and works in Hanoi, Vietnam.